Carlow Pride is set to make its debut on July 21. Oisin Kenny speaks to one of the organisers, John Paul. Events 12 April, 2019 . Written by Oisin Kenny. 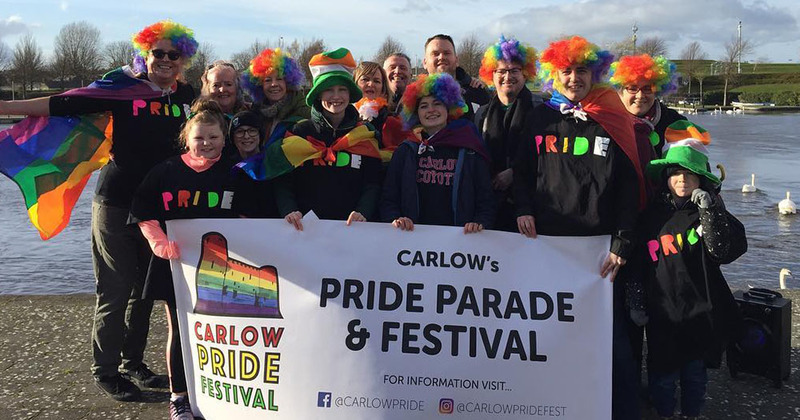 Carlow Pride was officially announced last Friday and is set to take place on July 21, with funding for next year’s parade already secured. With a diverse committee made up of volunteers aged between 19 and 75, the team has been working tirelessly to advertise the festival on radios, podcasts, social media, and in local magazines; Carlow Pride is set to be a turning point for the rural LGBT+ community. Carlow’s first pride parade festival is a healing experience for older LGBT+ people who have “scars from the past”, according to John Paul Payne, the leading organiser of the event. John Paul hopes Carlow’s Pride Parade Festival can be a “local beacon” for the LGBT+ people living in rural towns. Smaller rural towns can be isolating for the LGBT+ community, making it difficult to gain a sense of community as many people travel to larger cities to access public services and participate in events such as Pride. Growing up in 1980s rural Ireland, John Paul felt its isolating effects during his teenage years. Recently, he has spent years in Canada reporting on an LGBT+ TV programme, he firmly believes that: “everyone has a connection, a similar thread”. Returning from Canada, he began to set up the festival through a Facebook, which subsequently grew into a committee. The difficulty in spreading the word to the older LGBT+ community (who are not on social media) led the group to work closely with Carlow Credit Union, setting up news bulletins in store to gain a larger outreach. The Carlow Pride Parade Festival committee aims to create a lasting legacy for both Carlow and the LGBT+ community. The committee has worked closely with both Carlow College, St.Patricks and Carlow Institute of Technology to promote inclusion and awareness. The parade will commence on the grounds of St.Patrick’s college. People who do not feel comfortable marching can share their stories on speech bubble placards that marchers on the day will carry. ‘Carlow Pride Parade Festival’ is written across its logo in the Carlow colors of green, yellow, and red. Above the name is the image of a 13th century Carlow castle draped in the rainbow colors. The logo shows respect for and desire to be “part of Carlow’s past and future”, said John Paul. “Carlow is really ready for it,” Ciaran Rea, the secretary for the committee, said. He has been delighted with the amount of support the event has received from the Carlow community. The experience has been stressful but he encourages people to get involved as it will be “something to remember”. Carlow’s first pride parade is a life-changing event for many people, John Paul holds faith in the local community and maintains that it is just the beginning: “Carlow is progressing”. 12 April, 2019 . Written by Oisin Kenny.